Vintage-inspired and vintage re-issue watches are everywhere, and Baselworld 2018 only further highlighted the fact. Over the fair week, countless articles were published praising watch houses for showcasing these stunning re-editions. But is the current vintage trend something we should all be wholeheartedly embracing? This year we see reproductions of classic models from makers such as Seiko, Longines, Tissot, Mido, Certina, Blancpain, and Omega, just to name a few. Don’t get me wrong, I like a vintage watch as much as the next person, but that’s just it: I like vintage watches. I like vintage watches so much that my prized possession is a 1978 Rolex Submariner Reference 1680. Why do I love this watch so much? Not because it looks like it’s from 1978, but because is from 1978. The New York International Auto Show opened its doors as Baselworld came to a close and, looking at those new launches, I feel as though the watch industry could learn a thing or two from the automotive world. “Just announced, the new Jaguar V-type Heritage – comes standard with vintage-inspired pre-scratched hood” is an article you would never see because it would be ridiculous. It would be a gimmick, and no serious car manufacturer would want to attract customers with such gimmicks (although some have indeed tried). When Volkswagen’s new Beetle was launched, for example, it came standard with a flower attached to the dashboard. Understandably, Volkswagen has discontinued this feature in the current-model Beetles. I don’t know anyone who thinks the flower-endowed New Beetle will be going down in history as one of the greats. Interestingly, though, this is the type of thing we saw gracing the halls of Baselworld 2018: models such as the vintage-inspired Longines Heritage Military with faux age spots on the dial. But don’t fret, the spots are applied at random so no two are alike. Come on, Longines, we can do better. The point of vintage watches is not the fact that they look old; it’s the fact that they are old. It all tells a story: the age spots, the discolored dial, the cracked luminous paint. All those features were earned over years of wearing. Another example of a vintage throwback being taken too far is the Omega Seamaster 1948. This watch looks incredibly similar to watches produced in decades past with it being an anniversary watch to commemorate 70 years of the Seamaster. Apart from the dial stating it houses a co-axial movement and has Master Chronometer certification and it being fitted with an exhibition case back, it’s a nearly exact replica. At one time I owned a vintage Seamaster that looked remarkably similar to the re-release in question. I really loved that watch and I was proud to own it, the reason being it was a beautiful vintage watch at a reasonable price with a strong, dependable movement. People would comment on that watch by telling me what a beautiful piece I owned, and the same still happens for my 1978 Rolex Submariner Reference 1680. People who know very little about watches are often in constant amazement that the watch is from four decades ago. When inspected closely and compared with a current model, though, even a watch layman can discern the difference; the discoloration, the cracked lume, the age spots. It’s these markings that tell the story of how the watch over time has aged and matured, how over time those markings were earned. I take no issue with watches that pay homage to times past, but some manufacturers are taking that too far. It’s not paying homage, its shameless reproduction. And reproducing these features in a factory is just plain wrong. In a world where advancements in technology are increasing at an incredible pace, the watch industry should be following suit. It should be striving to produce modern watches that aren’t lazy reproductions of times past. While I wholeheartedly agree that watchmaking should be a traditional art, it should be traditional by preserving finishing techniques, ways of dial making, and even maintaining case designs. Traditional watchmaking practices should be instilled in young watchmakers so that these arts don’t die out. If we think back to great watchmakers of the past, what did they all have in common? 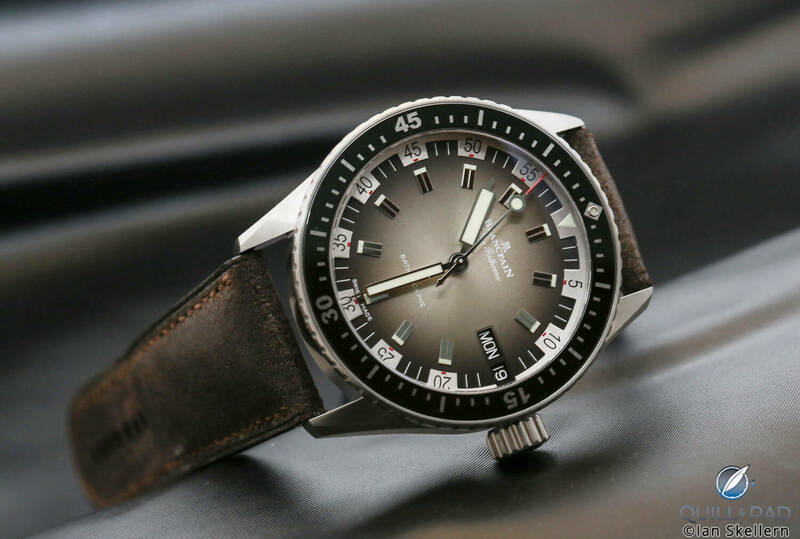 They pushed the boundaries, they strove to produce more accurate, more waterproof, more advanced, more reliable, and more useful watches than their counterparts. They preserved traditions, perhaps even inspired by makers of the past and improving upon them. It’s time to retire the current faux vintage trend because looking back at these watches on decades to come and deciphering the real patina from the fake will remind us of a time we would rather forget. Stripes must be earned by years of faithful service on the wrist, not given out at random in a factory. Let vintage watches be just that: vintage. You know what people will pay absurd sums of money for? An exact replica of Jimmy Page’s 1959 sunburst Les Paul Standard, right down to every nick, scratch, paint defect, and age mark. This trend will only get bigger, the watch industry is just well behind the guitar industry on this. I was just about to make the exact same comment! Watch world hasent a clue what might be coming down the line if a ‘heavy relic’ R9 LP is anything to go by! Wow, although I respect your opinion, I really dislike the way you have written it. And I personally disagree. I think there is a market for these type of watches. 1. The real vintage watches your hold so dear (and I do too!) are very often very pricey (at least the hot models), these new faux-vintage watches are sometimes cheaper, therefore attainable for less fortunate people. At least there are an option. 2. Some people just love the designs of the past and the new technology as well and these watches are a great way to get both. For example, I love the looks of my omega seamaster 300 60th anniversary and I am really happy it has the advanced co-axial METAS certified movement. Whilst I do agree people may enjoy the modern technology I can’t agree with the comments of certain individuals not being able to afford vintage watches. By that logic, we should have no issues with replica watches designed to fool someone into thinking it is the genuine article. Or…some of us may like the look but want some modern tech, performance and reliability? Gary brought it to the point : the best of both worlds a functioning piece with the looks of the good old times ! I totally agree. Lack of creativity. Just too easy. It feels fake. This is the era of vintage watches, I do not think that they will disappear any soon. They are like stonewashed jeans. The whole vintage trend comes from the fact that watches are obsolete today. Their golden age was the 40s-70s when they were key instruments for measuring time, exploration and combat. They are male talismans from a time when men were heroes. People buy them for this reason because they mean something not because they are accurate. And let me guess 20 years from now when most cars will be electronic and self-driving, traditional car manufacturers will do the same. It is most definitely an opinion piece and I have strong opinions about the subject. I respect all counter arguments and welcome them freely. Keep the comments coming. I agree with most of this article, as far as faux lume and the faux age spots on the longines, but as for the styling aspect, that’s a huge byproduct of the vintage market jumping off in recent years and if I have a choice between the original 34mm seamaster with no water resistance and potential trouble getting it serviced in the future, or the 38mm reissue with modern movement and manufacturing standards, and the new one is only like 25% more price wise, I’m going with the modern one. That said, this is a phase that will pass and watch makers can go back to coming up with 100 new brand extensions that won’t sell a fraction as well as the core lines (which happen to be vintage inspired or just haven’t changed that much over the years). It’s not all that bad. As long as the faux patina lume on the hands matches the faux patina lume on the dial. Real vintage watches that have mismatched lume are a bigger crime than manufacturers creating models with matching faux patina lume. Vintage reissues make lots of sense. I would much rather wear a watch with modern materials and engineering. Accuracy, scratch resistance and lume quality are perfect examples why wearing the modern watch is the best choice. How silly. The current trend merely marries vintage styling with modern technology. Analogs in the car industry are plentiful – see the new Jaguar D-Type or Aston Martin DB4 GT, or the Porsche and Jaguar homages by Singer and Eagle respectively, which are some of the most desirable vehicles in the world. It would be one thing if watch companies were making replicas of outdated movements as well, but the new Omega Seamaster 1948, for example, instead packs one of Omega’s cutting-edge master chronometer movements. What is nice about what is pejoratively called “fauxtina” is that it is actually functional lume, as opposed to aged tritium, which is functionally useless window dressing. These vintage-inspired models give owners all of the benefits of classic design, combined with all of the benefits of owning a new, modern watch, e.g., durability, current technology, serviceability, availability, price accessibility, no need to do extensive due diligence, etc. Do you also hate Breguet, George Daniels, and Roger Smith, who all use extensive historical styling cues in their watch designs? It is fine if you dislike the vintage look, but there is no reason to get on your high horse about it. And how do you feel about the faux age spots on the Longines featured here? I’m just curious. I truly admire George Daniels and Roger Smith. However, I feel that you have misunderstood their watches. They are not reproductions of times past, they merely pay respect to classic styling aspects. George Daniels did not set out to fool people into thinking his watch was a Breguet, but that is what we see Longines doing here. You state that people would buy a vintage reproduction because they can be assured of reliability, they are cheaper and are easier to service. Is that the same reason someone would purchase a Daniels over an original Breguet? No, and I feel such a comparison is apples and oranges. A vintage watch is only interesting to me when the owner has been wearing that watch for 30 or 40 years. Because the story of the watch is that person’s lived experience. When a 25 yo wears a 50 year old watch they are simply attracted to an aesthetic. Watch manufactures should definitely make money off of that attraction. I only buy new watches and create my own stories. You like used things. Good for you. Some do not. I would never wear a Watch that has been worn on a regular basis by someone before me. Just as I don’t buy used cars, used underpants or used water bottles. But I love vintage style. New vintage is therefore perfect. to each is own. you don’t like: don’t buy. No need to try to disgust others. Which laco model is sold with dented case? Which industry award you refer to? I did a quick search but could not find relevant info. Can you point me in the right direction? Found the lack models with dented case. Ouch! Models with erbstuck in the name !!! We get the full 9 yards. Dented rusted case, discolored dial, and “antique look” on the hands too. Thank god there is no ‘antiqu-ation” of the calibre inside, i hope. Yes, it is the Erbstuck series and the award is the IF Design Award 2015.
model Dortmund is the one that got the 2015 award. Now I fail to understand how one can receive an award for a design that is 60 years old? anyway, the Dortmund is a model with no “antique look” or pre-aging of case, dial or hands. Longines did not go far enough by a long way. We need scratched sapphire glass, we need overpolished back with faux discoloring marks of chromed back (made of lithium-aluminium alloy, why not). We need violet hues on blued hands complete with the slightly bent tip, colour obtained by a cutting edge laser process, please. We need cracks on the paint of that dial, not just a few aged dots and we need their randomness to be fractal based. We need faux marks of servicing inside the inner case, we do. And that cool accurate brand new calibre with silicon spring should not go into a 1940s looking watch. No!. This is too young and poor story telling. Stick it in a 1918 looking watch. The revival of 100years old design, available with one click on a mobile phone near you and hand carried … by a drone. YESSSSS! I started to wonder why the rolex gmt master II did not make the list? Design is 60 years old! Aren’t they trying to sell us new-old stuff? Red-blue bezel is a come back. So is the the bracelet. No? No! There is absolutely no intent from the brand to make the watch look old. They use all they have in hand to make it look new for as long as possible in the future with lume that does not age, indexes that don’t corrode, dial that don’t fade, bezels that don’t scratch. And inside is ticking an ever more precise and reliable calibre with oil that don’t dry. Great design never age! My money goes into products that did age and tell me their story or in products where i write the story. I have no money for products that come with a prefabricated fake past. What happens when an owner takes his beloved genuinely-vintage watch for service? The manufacturers often insist on mandatory replacement of beautiful and valuable original features like hands. If the owner declines, then the brand refuses to service. To add insult to injury, the same brands will have shut off the supply of spare parts to independent watchmakers, thereby monopolistically blocking the consumer free choice. This multi-headed hypocrisy is compounded if they then also try to flog faux-vintage watches. There are obviously several ways of looking at this but the bottom line is what the consumer wants. And the reason they are being drawn to vintage is the more modern watch designs in many cases are not very interesting and in some cases down right ugly. Take for example what Rolex has done with your Sub. Wide lugs, wide crown guards, maxi dial and hands all add up to one ugly watch even though the technical advancements of the current model are superior to your vintage one. But I think most people would agree that Longines has gone too far with that speckled dial on the Heritage Military. I started wondering why rolex master II did not come up with the list? Design is 60 years old! Are not they trying to sell us new things? This is an excellent discussion and timely. I am actually very interested in buying the Longines Heritage Military watch, all because I love that design. I think vintage equates to good design due to it being functional, easy to use, non-gratuitous in its design elements, modest, reliable, etc… I believe vintage watches were all about these design elements, which is why most watches today continue with these design styles, are inspired by them are revisit them with a re-issue. When good design is achieved it really can’t be advanced too much, except with inspiring slight variations. However, the internal technology, materials and production methods continue to advance. I recently saw an “original” Longines Military Watch in very good condition for sale. I think it was for approximately $2,800.00. It was beautiful, pretty much identical to the re-issue referenced here. It had some natural patina and “usage” on the case, but I really don’t want to spend that kind of money on a watch that may stop working and may be very hard and expensive to service. It would start to provide me with more frustration than inspiration. Often over the years I would find a great looking vintage watch and wish the company made the same one… with all the aforementioned improvements. Again, it’s that well thought out design which is timeless mixed with the new. Thus, I feel my expenditure won’t be compromised by age related failure. I also agree with some of the faux critics. I would not advocate or buy a time-piece that is pre-dented or scratched. But faux aged lume or faux patina (done well) on the dial is a design style which, to me, does not get in the way of a good design, it just provides a bit more emotion and relationship to a time past. I’m all for “advancing” design, but I really think good design for watches were established years ago. Akin to Leo Fender when he created the Stratocaster / Telecaster… those designs haven’t changed since the late 1940’s. Many future companies have copied his styles (same with Gibson). I think what has happened with the watch companies is they starting exploring new designs and sizes (very large) and came to the realization they had already created great designs years ago, hence the re-issues.